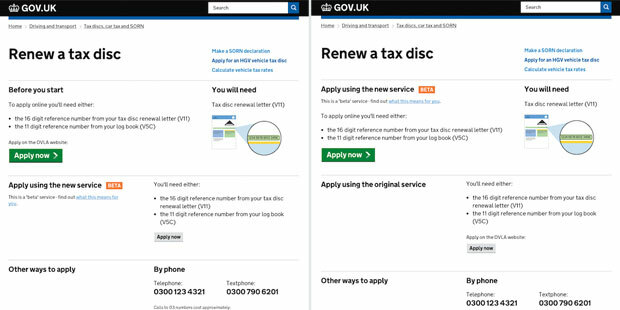 Back at the end of February, we launched a public beta of the Renew a tax disc service. Since then, nearly 200,000 people have taxed their car using the new service and we've been iterating and improving it based on the feedback we've received. Today, the beta is entering a new phase as we start to prepare for it becoming the main way to pay for Vehicle Excise Duty (the official name for the tax disc). When the beta was launched, it was added as an option on the GOV.UK start page underneath the link to the original service. Our data suggests that approximately 3-4% of users were choosing to use the beta from this link. Recently, we've been working with the GOV.UK team to make changes to the start page so we can promote the beta to more people. Using some tools built for multivariate testing, they've made it possible for us to slowly increase the prominence of the beta. We've now turned this on. This means that approximately 1 in 5 people should now be presented with the beta as the main option on the start page. We've already started to see an increase in users and we'll be monitoring how well the beta performs over the next few weeks with this new influx of users. Hi, I am wondering if there are any plans to make tax discs only available online, or will I still be able to apply via the post office as I only have limited access to the internet. There currently aren't any plans to make tax discs available online only. People will still be able to use the Post Office or telephone to pay for a disc. I bought my new 6 mths tax in July. What happens when October comes? Will I have to pay again ? Hi there, I have payed for tax disc online using this beta service and even though the money went through, the vehicle still appears as untaxed. What should I do as I spend £145 to tax my car and this is not updated on the vehicle status online? I tried to find a number to call but there is no number available. Hi, you can find our contact details at: http://www.gov.uk/contact-the-dvla. Our vehicle enquiries team will be able to assist you.